COLOR CHOICE .. Shakira Wig .. Cool Retro or Modern Style! COLOR CHOICE .. Shakira Wig .. Cool Retro or Modern Style! COLOR CHOICE .. Shakira Wig .. Cool Retro or Modern Style! All my wigs fit the average head size, but are adjustable to fit a slightly larger head as well. Gorgeous New TOP QUALITY Wig from the Express Yourself Collection. This is called Shakira. Nice Big Loose Curls and Layered. About 17" overall length. Very natural looking. All my wigs come with care instructions on the tag and the size is average, but adjustable to fit a slightly larger head as well. This looks and feels like Human Hair, but is actually 100% Modacrylic wig Fiber, very easy to care for! This is available in the following colors, but PLEASE BE SURE TO PUT YOUR CHOICE IN THE COMMENTS BOX and ALLOW UP TO 3 WEEKS FOR DELIVERY WITHIN THE USA ...LONGER FOR INTERNATIONAL. 1-jet black, 1B-natural black, 2-darkest brown which is almost black, 4-dark brown, 6-chestnut brown, 27-strawberry blonde, 30-medium auburn, 33-dark auburn, 130-fox red, or 6/30-chestnut brown and medium auburn frost. 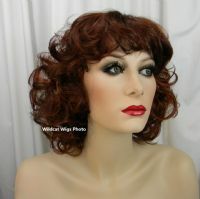 Please check my other great wigs, and save on shipping costs, but you must make ONE payment for all of your purchases. DO NOT MAKE INDIVIDUAL PAYMENTS! 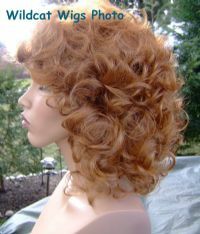 Thanks for shopping Wildcat Wigs! SALES ARE FINAL WITH NO EXCEPTIONS.